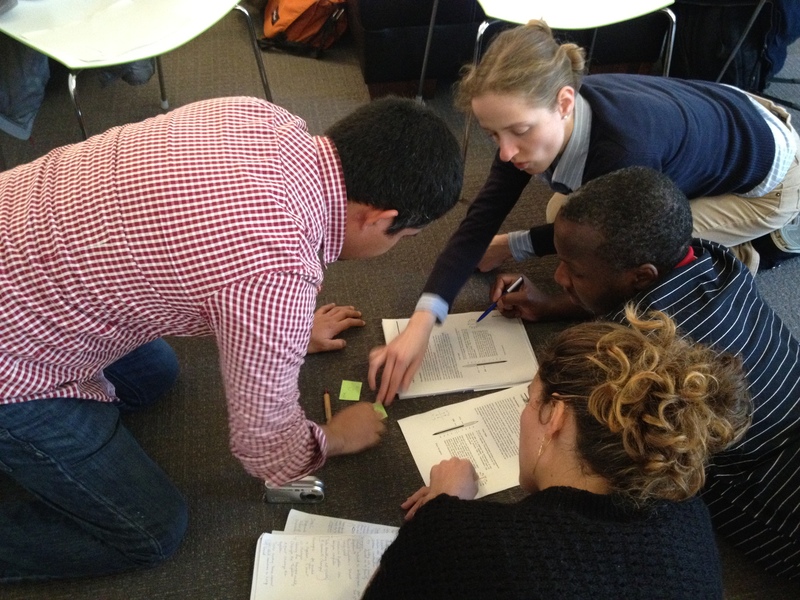 This week’s training will be taken by Fabian & Michael, and will focus on Systems Thinking – SINFONIE. This is a topic the group have been looking forward to, useful as it can be applied to many different projects, both throughout the course and on the participant’s return to their jobs. Before the training, the review group selected last week presented their results, which came in the form of games. 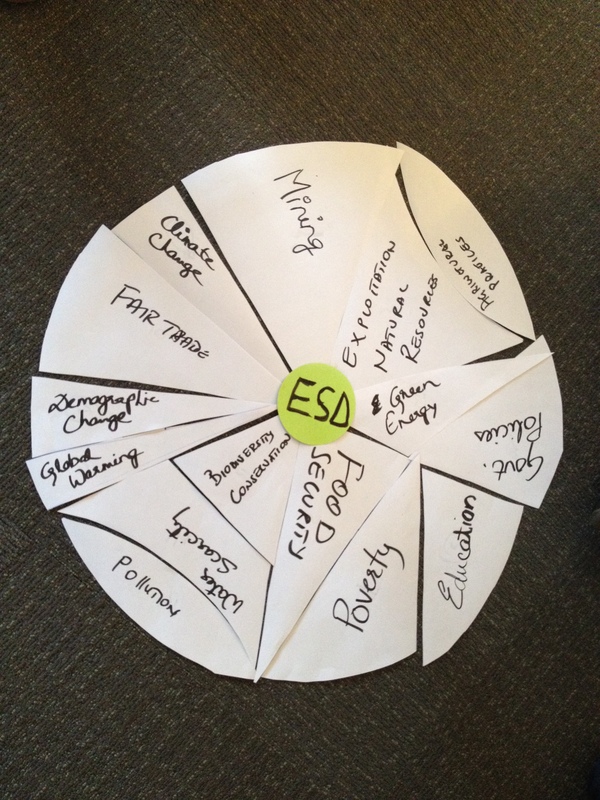 Firstly, a puzzle had to be put together, which once completed showed 15 elements discussed last week that relate to ESD. Then each visit made during the field trip was briefly summarised by a participant, leaving us ready to move on to the week ahead. The answers showed that while some participants had a vast experience of Systems Thinking behind them, others were new to this process of thinking and may require more guidance than others. The next exercise was boys vs. girls, in a coat hanger hanging challenge! 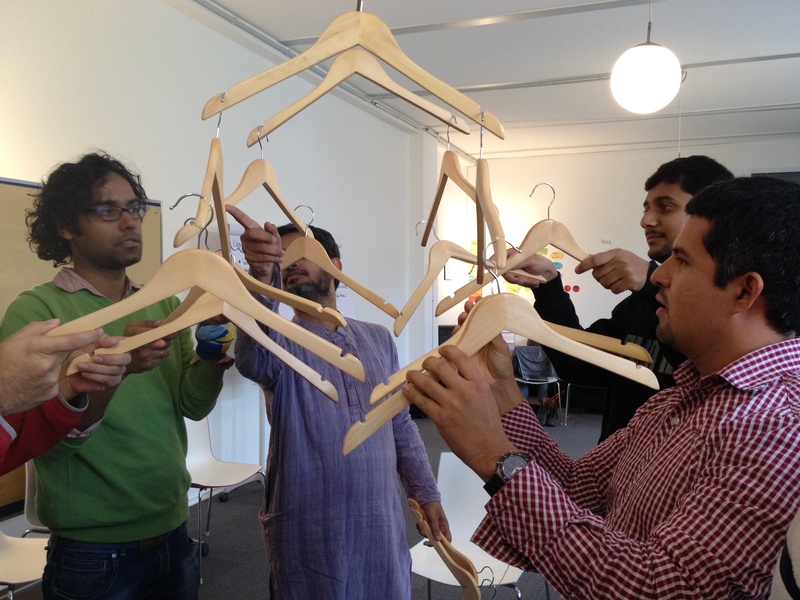 The aim was to hang all the hangers off each other within a limited timeframe. It was followed by a discussion of the approaches used, and how what was learnt from this can be applied to Education for Sustainable Development. For example, the group realised that everyone is important, sometimes it is important to take a step back and that if one thing is removed, the consequences are often unpredictable. After lunch, to further understand systems thinking, a ‘Heap of Sand’ became the talking point for the group. Is it a system? Or a heap of sand? Strong opinions were shared, before the final exercise of the day. ‘The Cold Store’ requires 4 groups to fix a hypothetical ‘broken fridge’ in a supermarket. This involves turning a wheel to the correct temperature manually, however the wheel is not in direct correlation to the temperature, which must be brought down from 17.4°C to 4°C. Each group had 20 guesses. Discussion followed, as none of the groups had found the correct answer. It turned out all groups had missed a vital clue within their instruction sheets, that their actions had a 15 minute time delay, making all their guesses uninformed. The perception of the system by the group will change the more they know, and this will then inform their decisions. Monday finished with German class. More System Thinking tomorrow.